A handful of business jerks predict the end of the financial world in a comedy of apocalyptic proportions. They’re not exactly the Fellowship of the Ring: One guy, the real-life Dr. Michael Burry (Christian Bale, embracing a near-Aspergian intensity) blares heavy metal out of his office and analyzes the paperwork of thousands of failing home loans. Another one, our narrator, Jared Vennett (Ryan Gosling, on fire), yells his colleagues out of the executive washroom to unleash torrents of cell-phone assholery. A third, the investment consultant Mark Baum (Steve Carell), steals cabs from more patient New Yorkers, hustling his way to high-pressure meetings where he’ll whine out his fury. And yet, in the subversive, riotous The Big Short, these are our heroes (of a sort)—the few, the brave, the vicious, who somehow predicted the 2008 housing collapse years in advance. They’re an extremely unpleasant bunch to build a movie around. Even worse, as chronicled in Michael Lewis’s deft 2010 best-seller (on which the script is based), they all made a killing while billions in pensions and savings went up in smoke. Still, it’s impossible not to be swept up in their Cassandra-in-the-wilderness craziness because we know they’re right. Almost halfheartedly, The Big Short reminds us—via a bearded Brad Pitt as an eco-conscious trader—that millions of lives will be ruined. Mostly, though, the movie’s a sick thrill, a toast to the douche bags. Director Adam McKay has, up to now, made things like Step Brothersand Anchorman: The Legend of Ron Burgundy. Now isn’t the time to demean those films—they’re exquisite tantrums of unchecked aggression and, in a way, a perfect résumé for The Big Short. McKay, more than any director who’s taken on this subject to date, sees the banking crisis as a shriek of ego, which it was. He brings on the smirking agents who sold multiple homes to strippers. Then he brings on the strippers and the crocodile that now lives in the abandoned swimming pool. 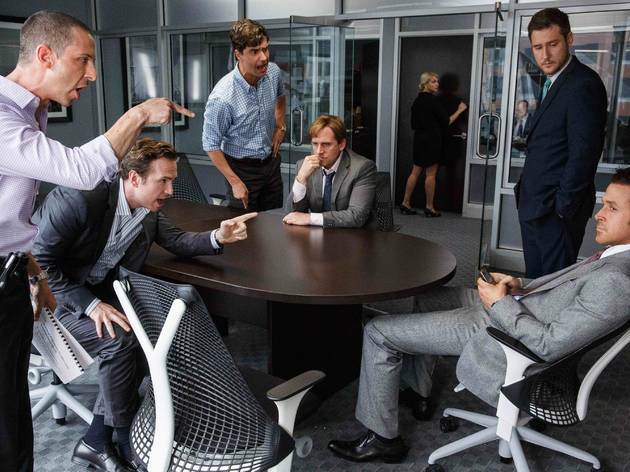 McKay’s zaniness has a precedent: Like Stanley Kubrick’s Dr. Strangelove, The Big Short is a gleeful tumble toward the apocalypse, except in this case, it actually happened. Some of the ideas here are fuzzy—how could they not be?—and certain attempts to explain the housing bubble, via cheeky cameos by Selena Gomez and Anthony Bourdain (among others), lack the nerve of the sinewy main event. But when a Hollywood comedy turns the crime of the century into a lark, you know a huge gamble has been chanced and won. I was skeptical about a movie that pinned Steve Carrell in a more serious role. It took some getting used to, but he was more than up to the task. The Big Short is an entertaining, if not somewhat informative look at the harsh reality of those who prospered during housing collapse in 2008. Plenty of finance terms and acronyms were introduced throughout the movie as explained by Selena Gomez, Margot Robbie playing themselves. 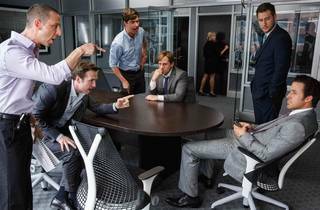 It's heavy on satire an will likely make you hate finance bros even more, but it was an entertaining movie. For a reality that took place in 2008 it's pretty amazing that only in 2016 is there a film that's able to explain what's seemingly complex in layman terms... And by layman terms, I mean that even Selena Gomez is able to explain the structures of a CDO. This dark comedy lifts the lid on a greed fueled world revealing how little accountability or care can be taken when profits are involved. The film finishes on a dark note, I wont spoil the ending, but it's worth a watch. Perhaps this dark comedy bites off more than it can chew, trying to make sense of the gigantic cluster**k that was the banking collapse of 2008. It's extremely complex and wonky, and even the sharks who rigged the house of cards in a morally-bankrupt wager against the entire economy don't really understand how it all worked. Christian Bale is frighteningly focused as the emotionally damaged investor who set the train wreck in motion by betting against the housing mortgage market. Ryan Gosling and Steve Carrell have a ball chewing the scenery as "masters of the universe." There are no heroes in this sick tale, and I came away more disgusted than outraged. The game continues on the Street, after all, and none of the bankers went to jail for stealing our money. The Big Short keeps our interest by switching between documentary and traditional film styles, with clever cameos of celebs and experts attempting to explain the bizarre, new financial instruments that the banks devised to hide their mountains of bad debt. A funny, smart, well-acted film overall. Tackling a heavy subject with both satire and straight up absurdity, The Big Short is one of the best non-documentary documentaries to hit screens in recent years. The performances are all solid, with Ryan Gosling doing his best Leo in Wolf of Wall Street impression (a cameo by Margot Robbie places tongue firmly in cheek), and Steve Carell continuing to solidify his place as one of our best underrated character actors. McKay take a complex issue and makes it easily understandable and palatable for those who never bothered to investigate the complexities. While the horror of the economic crisis may not make viewers laugh out loud, it certainly gives a lot to think about, with a dose of outrage thrown in for good measure. McKay is stretching his comedic wings with inventive storytelling and here he soars.